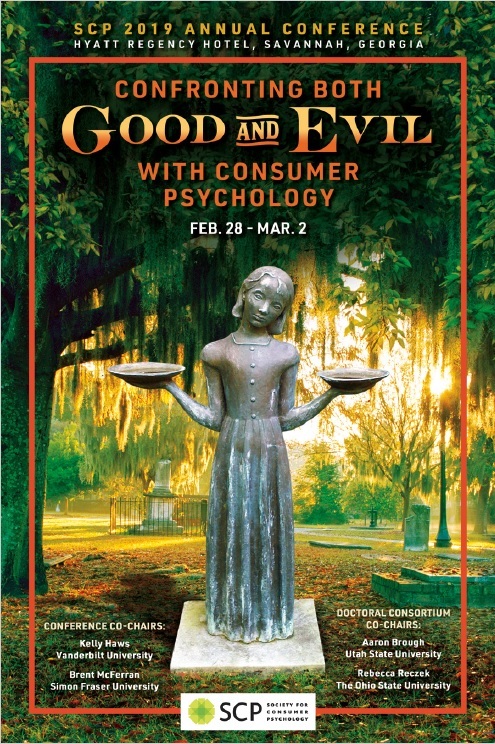 The Society for Consumer Psychology (SCP) will be holding its Annual Winter Conference from February 28 - March 2, 2019 at the Hyatt Regency Hotel located on the waterfront in the beautiful historic district of Savannah, Georgia. The Society for Consumer Psychology conference provides opportunities for a high level of interaction among participants interested in consumer research and in advancing the discipline of consumer psychology in a global society. In keeping with the well-known book ("The Book" to the locals) and corresponding major motion picture, Midnight in the Garden of Good and Evil, (written by John Berendt and subsequently brought to the screen as a Clint Eastwood-directed film) chronicling the lives of Savannah locals, the conference will aim to showcase both the "good" and "evil" of consumer psychology. As such, we will be featuring papers that address issues related to consumer welfare: both the "good" that consumer psychology can do for consumers and society, as well as grappling with the "evils" that can stem from the consumption of products, services, and experiences. We are particularly excited about our Friday Plenary Session featuring a joint keynote with Kelly Brownell (Duke University) and Sendhil Mullainathan (University of Chicago). Both are eminent scholars whose work spans disciplinary fields, and they will share thoughts on how social science research can inform consumer-relevant issues. In their keynote, they will provide insight into how and why their work has had impactful policy implications. We'll wrap up the conference on Saturday evening with a Southern Savannah Nights Party that will feature food, décor, entertainment and visits with some characters from Savannah's history and movies filmed in Savannah. And if you're brave enough, you can purchase a ticket on a Historic Haunts Trolley Tour and learn more about Savannah's haunted history. We look forward to welcoming you to Savannah, one of the most lovely cities in the South!